How to repair an LG LCD TV main board. This is a simple method to fix a TV or other electronic device with bad solder connections. The TV I fixed is an LG 42″ LCD TV Model 42LD550-UB.CUSWLHO. The TV would power on and the LG Logo screen with the clock would appear. It would freeze on the logo screen. It was stuck there and would not boot any further. The none of the buttons would work. It was totally stuck. First I tried unplugging it for about 15 min to reset everything, but that did not make a difference. Note: It’s always good to try this first on any electronic device. Also if the device has any kind of factory reset button, always try that as well before taking it apart. I searched around online and found other people reporting issues with this TV. HDMI ports not working, no inputs working, Lines on the screen, fuzzy video, etc… It seems many different makes and models are affected. I removed the board and I did not see any physical damage, no components looked fried or burnt, no capacitors looked bad, and all the connectors looked to good. This lead me to believe the main control board Model EBT60955753 LG MAIN (3642-1052-0150) could have one or more bad solder joints. This TVs was purchased in 2010 and out of warranty. A new board was hard to find, and too expensive. I decided to try this simple repair myself because I had nothing to lose! To fix it, I baked the main board in a electric oven for about 10 minutes at around 385 °F and It worked! Why did this work? After heating and cooling for years, tiny cracks can form in the solder connections. Heating the board to 385° F (above the solder melting point) caused the solder to melt and these cracks flow back together. Believe it or not, this trick works on more than just this TV. This can fix a long list of other electronics. It’s not uncommon for manufactures to under cool their components, and/or ship electronics with bad solder. Poor ventilation, bad fans, small heat sinks, dust, stress, and other factors can also cause over heating or cracked solder points. Even a very tiny crack that you can not see can cause a bad connection. Warning: Attempt at your own risk! Safety First! Always wear protective gear when working on electronics. Safety Glasses, Gloves, etc… Remove Electricity from the device (unplug) to Avoid Shock! Again, attempt at your own risk! This will void your warranty, and possibly damage the board. I have only tested this on an LG 42DL550! Other readers have had success on different models so search through the comments. I would only try this if the TV is unusable and you have nothing to lose! Step 1. Call LG and complain. Everyone complaining to LG might make them understand how unhappy people are, and they’ll see this is a known issue! Maybe if you play your card right, they will admit this is a fault with their product and send you a replacement. Step 2. UNPLUG THE TV before you touch it! Electric shock can cause death! Take pictures of the Board from all angles. Make sure to get good ones of all the connections. You can use these pictures later to make sure you reinstall it correctly. On the upper right there are two ribbon cables. To disconnect these, gently lift the thin black plastic strip on the connector (it flips up), then you can pull the ribbon cables out. On the lower right there’s a wide header block with gray wires. Squeeze the sides (opposite ends) of the connector to release it and pull up. On the upper left are two other connectors. In the center of these is a small plastic part. Press down gently on the edge of that (the edge near the wires), causing the opposite edge to lift a bit to unlatch. While pressing, pull gently in the direction of the wires, away from the board. Once all the wires are disconnected remove the six (6) screws holding the main board to the frame. Remove the black plastic face plate from the side input jacks. (No screws, it’s held on by it’s plastic clips). Why not use a heat gun? A heat gun is forced air like a hair dryer. As soon as the solder melts, the air will blow the components out of place, or even go flying off the board. Why not use a gas oven? Open flames can be dangerous in this situation. Why not use a microwave? Never put metal in a microwave! Very bad things can happen. The correct Temperature is IMPORTANT. If you don’t trust the temperature setting on your oven, or if your oven does not have a temperature setting, then get a baking thermometer and test your oven! 385 °F is working for most people, but there are different kinds of solder. Altitude and humidity might also play a factor. Most solder melts between 360 and 419 Degrees Fahrenheit or 180 – 215 Degrees Celsius. Solder is a mixture of Tin and Lead. NOTE: These temperatures might sound scary, but the ignition temperature of paper is around 451 °F so these components should not be damaged at these temps in an electric oven. Again, this is why we only us an electric oven. No open flames! See https://en.wikipedia.org/?title=Solder for more details about Solder. Place it on the center rack of the oven. It will smell funky when cooking so you might want to open a window and/or turn on a fan! Let it cook for about 10 min. Do not to bump or disturb it while it is cooling! I would not move it until its below 300 °F, so you don’t disturb any components! Just turn the oven off and leave the board in it with the door open until it’s cooled off a bit. If you take it out of the oven while it is still hot, remove the board very carefully, let it cool at least 30 min before you touch it. Make sure you get all the cables in the correct location. Double check each cable to make sure it’s connected correctly. Check your pictures to make sure you have everything correct. You might want to leave the back off until you test it in case it doesn’t work, and you need to bake it again. Just do NOT touch anything back there with it plugged in! BE SAFE! Try cooking it again for 15 min. Try a higher temperature 183 – 215 °C (361 – 419 °F) as noted above. One reader noted he went all the way up to 482 °F (250 °C ) although I highly recommend staying below 425 °F. I’m guessing his oven settings are off. Another reader said he put a weight on the LVDS chip while baking and that worked. Read through the comments, there’s a lot of good info in there. Please comment to let everyone know how it went for you! Include the Make and Model of your TV / electronic device to help others can find this post! Hardware DIY, Repair, TV. permalink. I was skeptical (mainly that I would screw it up) but it absolutely worked on my 55LE5400 TV bought in 2010. Followed directions exactly (almost gave up when the picture was bad after I plugged the cables back in – I had to go and adjust the cables a few times – after the third time with the cables it worked like a charm). it worked well after the baking except that I damaged the ribbon cable while trying to adjust the correct plug-in position as it was giving me half the screen. Wonder how I can replace this ribbon cable now? This worked for me as well, but the heat should also help the semiconductors in the transistors as well as any loose solder. Either way it works like a charm. I had issues where my 46LD550 would only display 720p all of a sudden, whether it be my PS4, WiiU, or Xbox 360. Eventually it would flicker even at 720p. I cooked the board per the instructions and right away I have 1080p back and I’m loving the clarity! Thanks for putting this together, it’s been great to see everyone’s feedback. Worked on my LG 42LE7500 from 2010. Thx a lot! I still couldn’t believe it. It worked on my LG 42LD550 as well. Thanks so much! I bought an LG Infinia 50PK750 plasma in October of 2010. It worked great until November 4, 2016 then all the inputs went out suddenly. I baked the board at 385F for 12 minutes and it worked! Until 2 days ago. On February 20, 2017 the same symptoms came back. I have just baked the board again, this time at 400F for 15 minutes. And it has worked for a second time. The first time lasted for 3 1/2 months. We shall see how long it lasts this time with a longer bake time at a higher temperature. Some of you had asked how long this fix might last, and I just wanted to present my experience. Next time it happens, I’m getting an OLED! I registered so I could post on here, because this fix has been a tremendous help for me, and I’m grateful. Thanks Zedic! I am going to try to bake it again and will update with the results. Thank you for this tip! It worked on my 47KV5500 and saved me from having to buy a new TV when I’m looking to buy a house. This worked for me! I was extremely skeptical but tried it anyways. I am from Brazil and your solution worked out for me, just want to say thank you! I think you are helping much more people than you could imagine. Just fixed an LG 55LE5400 (55″ LED/LCD, circa 2010), using a modified version of this oven reflow method. -Horizontal lines of white snow, on some parts of image more than others. -Issue occurs for inputs AND TV Netcast and setup menus (not cable or input related). -Issue came on pretty suddenly. -When I put pressure on the main chipset (in the middle of the board, pushing on top of the heatsink), the issue goes away. This confirms the molten solder balls underneath the chip are at fault. -Placed on cardboard, cut small square hole on bottom of cardboard so main chipset (middle of board) can get some underheating…like the board gets when you do a professional reflow. Placed mainboard roughly in the middle of the oven. -Once it reached 420 degrees, set a timer for 10 minutes. -Once timer went off, turned oven off but left door closed, so temperature would ramp down slowly…for about 5-10 minutes. -Cracked open oven a little so board will start to cool a little bit faster. -Once board is in the warm to cool state, took out and let cool completely. Worked Perfectly Fine for LG50PZ650 50inch Plasma TV. It was turning ON but no picture and no sound. Disconnected Z-sustain board still nothing, Then disconnected Y- sustain board and still nothing. So took a shot and removed the main board as shown above. Place it on cardboard in the oven. Bake it for 200 degrees celcius for 10 mins. Cool it for 20 mins and put it back. Shazaaam. TV started working again. Thank you so much my friend. Just baked my 42DL550. This tv was given to me because it wouldn’t pick up any stations, just white noise (static). Was going to replace main board until i came across this post. I’m thinking, “bake the main board” ???? After reading, it seemed to make sense. So i went ahead and “baked the main board” at 385 degrees for 13 minutes on cardboard, let it cool, reinstalled it, checked it out and VIOLA. Worked like a charm. Love my new FREE tv. Just tried this agin for the 3rd time since March last year. 200 degrees Celsius…12 minutes…worked yet again!!! Seems to get easier each time!!! Magic! My LG-42LD690 made in 2010 had no sound at all, but picture was working perfectly. I tried this only because of the amount of the comments and it worked like a charm! Thanks for saving all the electronic waste. Oddly, there seems to be many comments for TVs from 2010. I was pretty sure this wouldn’t work but like others had nothing to loose. Turns on. Backlight works. No picture. No sound. No menus. Remove main board and put on cardboard in oven at 200 C for 10 mins. Turned oven off and opened door slightly to let cool 15 mins. Took out and let cool on bench 15 mins. Reassembled and working. Still cannot believe it. Un énorme merci pour ce tutoriel qui pour ma part a fonctionné sur ma LG 42LX6500 3D. J’avais un problème de ports HDMI, ils reconnaissaient les sources branchées, mais aucune image sur la TV. Les autres connectiques (péritel, yuv, rca, optique etc…) n’étaient pas touchées par ce problème. Avant un changement de carte mère, opération de la dernière chance en suivant ce tutoriel, et miracle après 10min à 200°. A huge thank you for this tutorial which for my part worked on my LG 42LX6500 3D. I had a problem with HDMI ports, they recognized the connected sources, but no picture on the TV. The other connectors (péritel, yuv, rca, optical etc …) were not affected by this problem. Before a change of motherboard, operation of the last chance following this tutorial, and miracle after 10min at 200 °. Another success story here with my LG 32LD550 that was only showing the red light that would blink when trying to turn it on. I baked it at 380 F for 10 minutes on parchment paper. Opened the oven to let it cool a little and then removed it and let it cool another couple minutes before testing it. I was amazed this worked! Just did this and it worked on an LG 55 in TV where HDMI ports stopped working. Did anyone do any special clean-up of the oven/kitchen after trying this? My LG 42LD560 had stopped recognising HDMI inputs. Actually it recognised they were there, but displayed the “No Signal” message. Baked the main board in my oven at about 200 °C for 10 minutes, then let cool for 30 minutes before removing from oven. Put it all back together and now it works perfectly! Exactly one year after successful baking the mainboard of my LG its still running as new. I’ve been working with electronics for over 30 years, at first I did not believe it would work, I talked to a friend who makes the latest generation of SMD cards, I did not believe it either … but since the TV was Lost, I cooked my plate for 12 minutes at 220 degrees celcius and the TV was perfect! I learned two lessons with this story, the first one is that it is always worth the risk and the second one is NEVER TO BUY ANYTHING FROM LG !!! Thank you friends !! Works great with LG 55LD650 , first go. I had the red flashing light error. Holy SH*T—This really did work!!! I ordered a Brand New Main Board which I’m sure I wont get for a while, but based on other reports of this fix lasting for a while and then going bad again, I decided I don’t want to BAKE the circuit board again and deal with the Smoke and Burnt Smell for a few hours which my dog did not appreciate..
MY tv is an LG 47XL9500 Hi Def 3 D tv—hard to find a 3d tv these days!! My NEW board is costing about $220.00 shipping included, but its better than Spending $3000 and not to be able to see my md Movie collection!! Who knows…Maybe I will get lucky and this amazing fix will last a long time…. My LG 42LE5400 (December 2010) turned on the other day and showed the dreaded “No Signal” from the three HDMI ports. RGB cables confirmed the picture would still work the old school way. So I did what everyone else here did… Trolled the internet looking for a fix and found this blog. Who knew!!!??? This site saved my bacon! I diagnosed the problem, found this site, removed and baked the board (15 minutes [including warmup] @ 390 degrees F), cooled and reinstalled in an hour and a half. Used a toaster oven out in the garage due to the smell. TV works great now!! I wouldn’t have believed it either if I hadn’t read so many other posts reporting their good luck. I figured what have I got to lose? None of my peripherals use anything else but HDMI. LG 42LE8500 no sound, no picture, no backlight. They did not fix it even in an LG Authorized Service Center (main boards are not available). I baked it at 200 °C for 10 minutes. And… IT WORKS! My HDMI-ports stopped working and after 10minutes at 200 degrees celcius the ports started working again! This has worked 4 times for me now! 5th March 2016, 24th July 2016, 17th April 2017 and 17th September 2017. Honestly it is so easy I can’t justify throwing it away!!! Issue: HDMI Ports failing and sending screechy audio after 5 mins a of being switched on didn’t seem to be coming from the speakers as the mute and volume buttons did not silence it. in time now showing no signal error on the HDMI ports. Scarts and AV cables were still working, audio working fine. ‘Baked’ in the oven for 10mins @ 190c as instructed. After taking out of the oven I noticed the scart slots plastic mould had melted as well as the optical audio output connector, I don’t use them so I wasn’t overly bothered. So.. on reinstalling the board after cooling sufficiently I plugged in the TV and the HDMI lead in to slot 1.. (from my Xbox) hdmi 1 was showing no signal.. plugged in to slot 2, this was working, including audio. After a couple of minutes, maybe 10 as I didn’t time it, the audio started sounding scratchy and continued but could be silenced by the mute button and controlled by the volume keys. So, my problem has half been fixed as the HDMI port 2 works and the audio is better but not fixed, but now I have no scarts or optical audio if I would have need it in the future..
Did anyone else cone across this issue with the baking and melting the plastic bits? Also I found that some of the plastic ‘female’ connector parts were a bit more snug than they were before baking. I think I’m just gunna get a new main board I’ve seen on eBay for £15.. but thought I’d give this a go before, so for me nothing much lost. Thanks OP, but it did not work for me, sorry. I think your temperature was higher than set or you had hotspots in the oven. Maybe it was too close to the heating element? I’ve just baked my board at 200 C (stabilized during preheating, but with the board in it dropped below) for 13min and hadn’t experienced any plastic melting. The oven has a small vent that was working all the time, blowing the air below the center rack where I had the board seated. I think the vent helped distributing the heat in my case but I’m not sure if this ok in case of larger vents blowing directly on the board (like I’ve seen other ovens have). This worked for my LG 47LV5500. Just work for my LG 42LE5350. All 4 of my HDMI inputs stopped working. The main board is $290 so no way I was going to replace it. I baked for 10 minutes at 405 on my oven, 375 on a thermometer in the oven. The house smelled awful but my tv works again. Wow! Thank you! I can’t believe it worked! So my LG 42LD750 suddenly lost it’s HDMI connectivity. O all inputs was giving the dreaded no signal message. After a visit at a local TV repair shop that proved useless I eventually decided to try baking the motherboard. Removing the board was an easy process. All the connectors have a retention mechanism so don’t pull if it doesn’t get out easily. I used a small electric oven and an oven thermometer. After the temperature stabilized at 200 C, I’ve put the board in the middle rack on a piece of cardboard. Because the temperature dropped while I opened the oven door to insert the board, I decided to keep it inside for 13 minutes instead of 10. It released some nasty fumes that persisted for hours in the room after the baking was finished, so I regretted not taking the oven outside first. After 13 minutes have passed, I’ve let it in the oven to cool with just a small opening of the oven door. Haven’t touched it for 45 minutes or so. When it was cool I mounted it back in the TV and now everything is working properly. Now all HDMI connections are working. Yey! Let’s hope it hold. Supper useful and easy fix. I recently purchased a $7000 65″ LG Signature G7 OLED unit. Called LG Concierge for assistance with HDMI port failure on a rarely used 32″ display in my office. They couldn’t care less. Are there any attorneys interested in pursuing a class action lawsuit? Bad publicity may cause them to rethink their position. To pay $200 to repair a $300 television set is ridiculous. Although baking the board appears to work, end users shouldn’t have to be doing this. On principle, I will never again purchase an LG product. Add one more to the list. My 55LE8500 suddenly lost all HDMI inputs. Luckily I came across this site, and gave the baking method a go. Simple procedure..and worked wonders!! Let’s see how long the fix will last. Big thanks to Zedic!! 200 degrees for 10 minutes and worked first time. “HDMI No Signal”, same resolution. Owen set @ 200ºC 12 min. Clean! Just wanted to say thanks again, I’ve just ‘baked’ my board for the 4th time in 3 years! I figure at some stage it will stop working but I’m glad you posted this fix! Thank you Zedic.com! I just removed the main board from our LG 42LE5400 (mfg date of Dec 2010) and “baked” it. We had the dreaded HDMI “no signal” come up suddenly two days ago while just watching the TV. I set the oven at 380 degrees for 10 min. Just a hair lower temp. than your recommended 385 because I think our oven runs a bit hot and I’ve got kids and pets and wanted to minimize any fumes. For the record there was less smell than when I use high heat to bake chicken wings! LOL! …Really no prob at all with fumes and zero smoke. The bake process worked like a charm! All four HDMI ports are operational again. I’m too am very glad you posted this EXTREMELY useful process. If I could rate your blog on this it would be MAX stars for sure! My LG 42LE8500 started flickering when powering on and then rebooted (LG logo with clock) to start flickering again. For 5 seconds and then it would be fine. I registered to the site just to thank you, and to add my LG TV to the list of successful bakes. My 42LX6800’s HDMIs started working again! Warning! 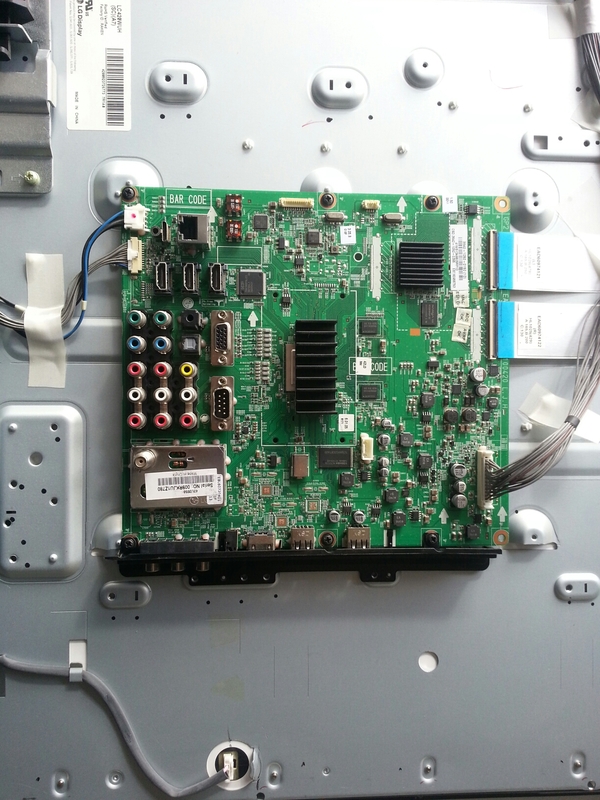 Just tried reflowing my mainboard on my LG 47LW5600-ua TV. It had gone out totally but I had the power light. After reflowing first time I got picture back but it was distorted with lines and color blocks etc. Tried adjusting through settings on TV but no joy. Then I saw the post from VirgilBudBrigman about heating to higher degree setting for the newer solders. I think it completely fried the board as I am back to totally black and no sound but have power on light. Now I’m down to looking for what is probably a non-existent main board. Me TOO! have a 42DL5400 purchased sometime in 2011. I was the only one home. turned off the TV and all was fine. came home the next day and got the spinning no connection. tried every HDMI cable with every device in the house to no avail. decided to bake the board!!!! 12 minutes at 385-400F. opened house to vent the smell while the board cooled. put it all back together and now we are watching TV through the ROKU connected with an HDMI cable. lets see how long it lasts. beats throwing it out.